Introduce your kids to sewing with 14 new and updated boredom-busting projects that teach an invaluable skills they'll carry with them for a lifetime! Starting with beginner-friendly projects to learn machine-sewing basics, kids will work their way from handmade cards and cool accessories to fun challenges like fabric notebook covers and a drawstring backpack. 37 projects and activities. Written by Lynda Mulligan and Nancy Smith. Published by C&T. 128 pages, paperback. This is the book that every family needs! Imagine your children or grand children’s pleasure and pride when they learn how to sew their own gifts and other projects. Now the first two titles in the award-winning “I’ll Teach Myself” Sewing Machine Fun series are available for the first time in one convenient volume! 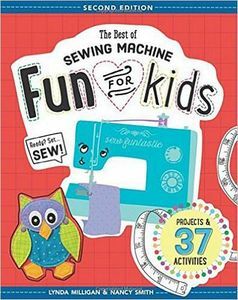 “The Best of Sewing Machine Fun for Kids” offers a delightful introduction to the world of sewing for children aged 7 and up. Clear, colorful directions help kids have fun as they develop skills that will last a lifetime. * Sewing Machine Fun was the winner of the Parent's Choice Magazine Gold Seal and the Oppenheim Toy Portfolio Best Toy Award! With more than 50 years combined sewing experience between them, JoAnn and Corrie have seen a real need for a basic sewing primer, geared toward 8-16 year olds. As 4-H istructors and teachers, they have worked extensively with young and old, novice sewers, and assembled the 14 sewing lessons in Stitches and Pins based on a curriculum that has been honed and finessed through their years of teaching. Because the sewing projects begin with the very basics, and then advance gradually to increasing complexity and skill, Stitches and Pins can be used with confidence by a non-sewing parent, and an older child could go through it independently. All necessary sewing patterns, girls sizes 8-16, are bound into the book and each of the 14 projects is a fun, practical item that any girl would be proud to use, wear, or give. 18" doll clothes patterns that match the projects in this book are also available. Stitches and Pins is spiral bound and printed on coated, gloss paper. The sewing patterns are printed on one side only, and the sewing book is written in a way you will understand, with lots of illustrations to make using it successful.